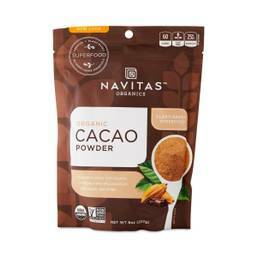 What is the difference between cocoa powder and cacao powder? Can they be used interchangeably (taste and function the same)? I understand somewhat the processing difference. It's like cold vs hot pressed oils, cocoa is "hot pressed" and cacao is "cold pressed" so I would imagine that you wouldn't get some of the roasted flavors in cacao. I tried eating some plain powder of both. Bitterness was about the same, and the cocoa seemed a little chocolatier but kinda hard to tell from eating dry powder. I'm not asking from a health perspective, only from a culinary one. This is in the eastern USA. I learned* that before roasting, the (raw) beans are called cacao, after roasting it is cocoa. And yes, that does noticeably change the smell and taste. AFAIK, only special kinds of cacao are consumed without roasting. I recently had some samples of raw cacao and roasted cocoa beans in the lab (same kind of cacao, same region + cooperative doing the fermentation) and they did smell very differently. Only the roasted samples had what I'd call the pleasant cocoa/chocolatey smell - I'd have said the unroasted samples were much different, not just a bit less chocolatey. That being said, I'd suspect that cacao vs. cocoa could also be a caused by non-English product naming: In German, it is usually Kakao (before and after roasting), but occasionally Cacao is used, presumably to create an impression of old-fashioned quality produce. Or maybe to refer to the Spanish term. Your example cacao says on the backside that it is actually produced from unroasted beans. It is degreased (cocoa/cacao butter removed), though: raw cacao beans have roughly 50 % lipids (cocoa/cacao butter) whereas that powder has 10 % lipids. Degreasing is AFAIK part of the milling/grinding process: the beans or nibs are put through roller mills and the molten cocoa/cacao butter (melting at 34 - 38 °C, so roughly human body temperature) can then be removed by pressing. Thus, a certain amount of heat is involved, but far less than in roasting (e.g. 120 - 140 °C). Why does Weikfeild cocoa powder does not taste bitter? What can I do with solid cocoa? Can I buy cocoa butter squares for cooking?